Peel 1 mango, chop into pieces to remove the pit and add it to the blender. 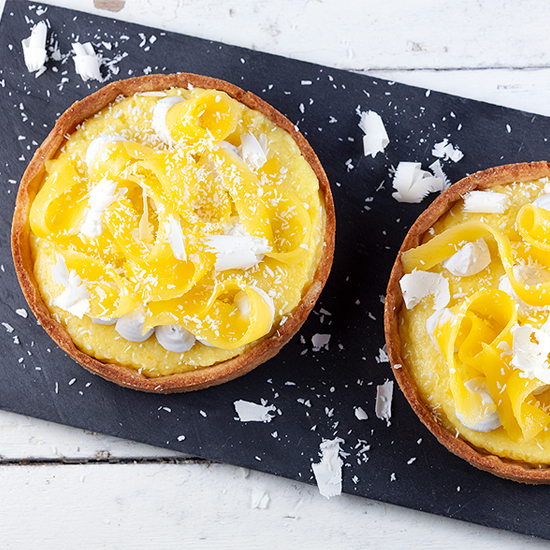 Create a smooth mango puree along with juice of a lime, 60 gram powdered sugar and about 175 ml coconut milk. Combine the rest of the coconut milk with cornstarch until it’s a smooth mixture. 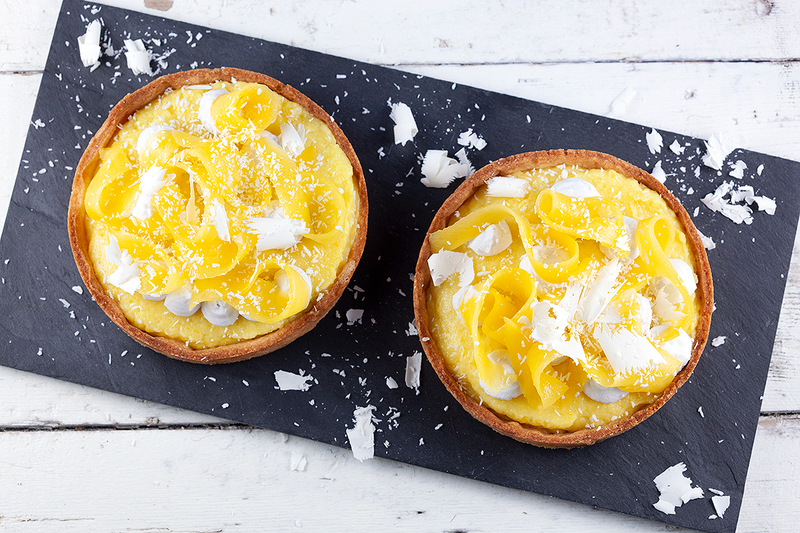 Heat the mango and coconut mixture on low heat. As soon as the mixture is warm you can add the cornstarch mixture, keep on stirring to prevent it from burning and creating lumps. You’ll notice the mixture will become thicker, turn off the heat as soon as it reached the desired thickness. Let it cool off a bit and place a piece of parchment paper or cling film on top to prevent it from creating a skin on top of the filling. Combine flour and salt and gradually add the soft butter into pieces. Knead until you’ve reached a crumbled dough. 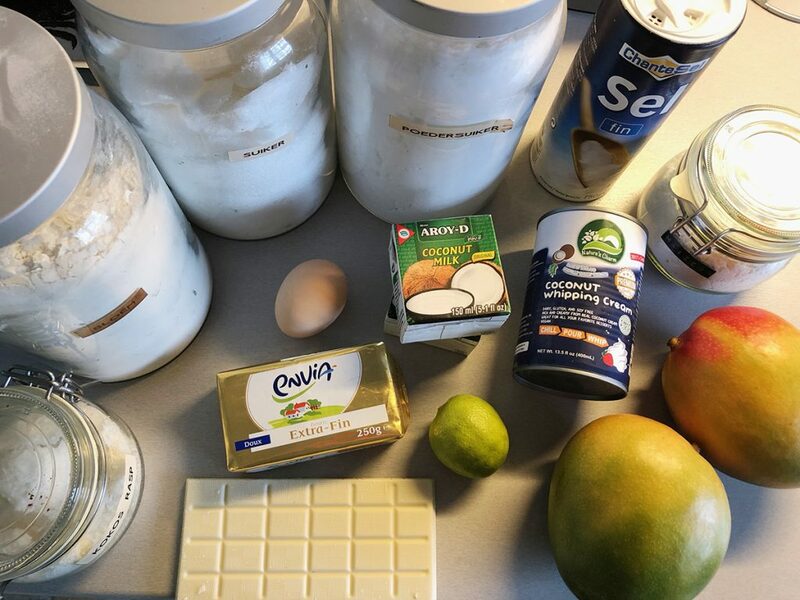 Mix the egg and sugar with a fork and add it to the dough. Knead until you’ve reached a dough ball, wrap with cling film and refrigerate for about an hour. Pre-heat the 180 degrees Celsius or 350 degrees Fahrenheit and coat the pie dishes with butter. Dust the work surface and rolling-pin with flour and roll the dough until it’s quite thin. Line the pie dishes with the dough, poke a few holes in the dough and place a piece of parchment paper on top of every pie crust. Fill with a handful of blind baking beans and bake the tiny pies for about 10 minutes, or until the dough is beautiful golden brown. Remove the blind baking beans and parchment paper and let the pie crusts cool off completely. Peel the second mango and divide into small slices, the most easy way to do this is using a vegetable peeler. Cold coconut whipping cream can be easily whipped with a standmixer. If you’re using regular coconut milk, it’s also possible but it won’t stay firm for a very long time. You can also substitute with regular whipping cream. 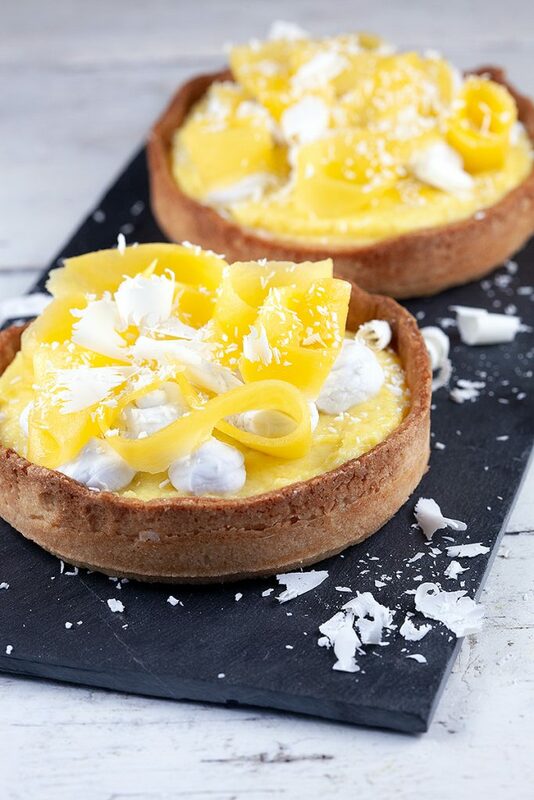 Finish the tartelettes by filling them with mango cream and then garnish with (coconut) whipped cream, mango slices, grated coconut and white chocolate shavings. Enjoy!